Cape Town – The DA "fabricated" the Day Zero water crisis in Cape Town to set the scene for desalination contract kickbacks from the "Jewish mafia", some ANC members of the Western Cape Provincial Legislature claimed on Friday. "The DA only terrorised people in order to leverage money from the national government," claimed African National Congress Member of the Provincial Legislature Sharon Davids. She said the DA's previous head Tony Leon was hired to communicate the party's "doomsday message", of Day Zero to make people upset. Speaking during replies to Premier Helen Zille's State of the Province Address which was delivered on Thursday, Davids claimed these allegations were behind the apparent fallout between Zille and Cape Town Mayor Patricia De Lille, and the apparent hounding of De Lille who recently survived a motion of no confidence started by her own party. "Premier Helen Zille had it in for Patricia [De Lille] after she stood up to her about this land in the Jewish area," said Davids, referring to the sale of land in Sea Point to the Phyllis Jowell Jewish Day School. "Premier Helen Zille is too much in love with the Jewish mafia," she claimed. Davids said "proof" that the DA was favouring Jewish people was illustrated by party leader Mmusi Maimane hanging out with DA MP Michael Bagraim, who had spent time on the SA Jewish Board of Deputies. 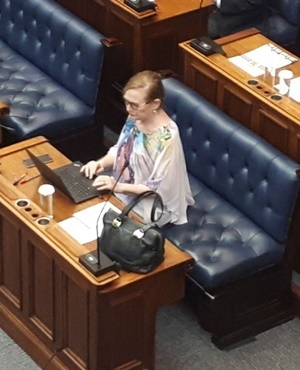 She called for the scope of the state capture probe to be broadened to examine allegations that the DA in the Western Cape is captured through "brown envelopes" and kickbacks. Three MPLs on the DA side of the legislature objected to what they considered anti-semitism, and a statement was circulated shortly afterwards while the sitting was still in session. "The Democratic Alliance in the Western Cape Provincial Parliament (WCPP) condemns, in the strongest possible terms, the blatant anti-semitism which the ANC repeatedly expressed during the Western Cape Premier's State of the Province Debate in the Western Cape legislature today," said DA chief whip Mark Wiley. Davids' remarks violated Article 15 of the Constitution, which protects freedom of religion and belief, and was a "hurtful and most racist remark" that could incite violence, he said. "We will not allow the ANC to make a mockery of our hard-won human rights," said Wiley. Local Government MEC Anton Bredell said that if the ANC MPLs had bothered to attend meetings, they would know that the point of the Day Zero campaign was to avoid Cape Town running out of water during the drought. He said there would not be a point where there was no water, but rationing would kick in when the dam levels hit an average of 13.5%. He said the national Department of Water Affairs had refused to acknowledge that there was a water crisis, and had taken from 2015 to 2017 to decide whether to declare a disaster. The national government had allocated R74m for drought relief in August, but did not Gazette it, so capital for bulk water projects could not be used until December 2017, Wiley said. He said the department was causing confusion over water saving and the drought. ANC caucus leader in the legislature Khaya Magaxa claimed that the DA wanted to skim R600m off desalination contracts for its 2019 election campaign. "The DA has manufacturerd this Cape water crisis," he said. The ANC's Cameron Dugmore called on the DA to reveal its links with developers and claimed they were getting "red carpet treatment", with no environmental commission to hold them to account on environmental impact studies either. Zille will reply on Monday, February 26.